Arisi paruppu payasam prepared with moong dal, raw rice, jaggery, coconut and cashew nuts. This payasam is easy to make with simple and healthy ingredients. 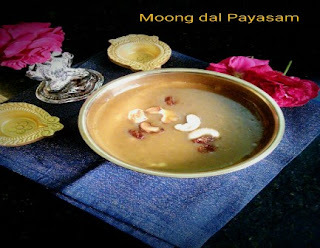 You won't go wrong with this payasam and it is perfect for family get together or for any festivals. 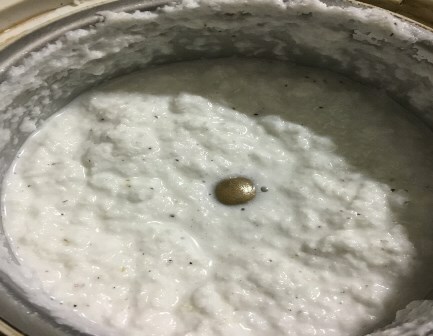 Raw rice works good for this payasam as it produces a nice aroma. Roasting the moong dals and raw rice produces an aromatic payasam. Make sure to use rice in lesser quantity because it expands after cooking and it will absorb the sweetness. 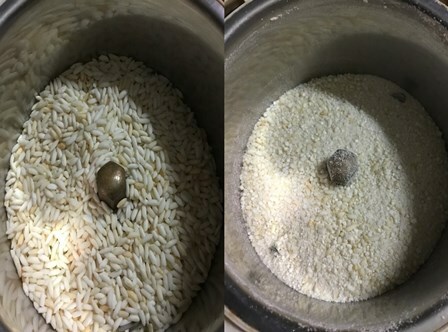 Just a handful of rice has been enough for 1 cup moong dal. For payasam, pongal and other traditional desserts I always prefer pagu jaggery but if you can't find it, regular jaggery will work fine. 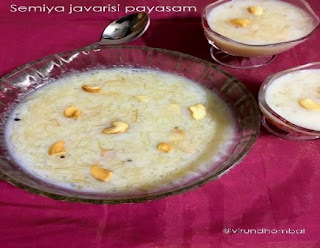 The best way to prepare payasam is to cook slowly on low heat until smooth. We must stir it frequently to avoid sticking at the bottom. 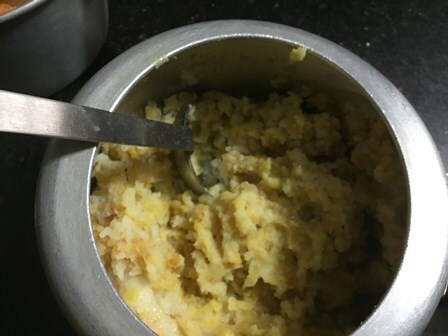 If the payasam cooked too quickly in the jaggery syrup it turns out very thick and your payasam will look like halwa. This payasam should have a smooth consistency. 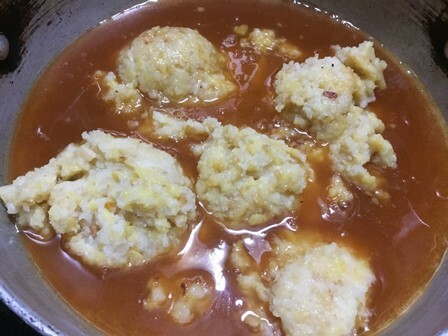 Now let's see how to prepare this Arisi Paruppu Payasam with step by step photos. 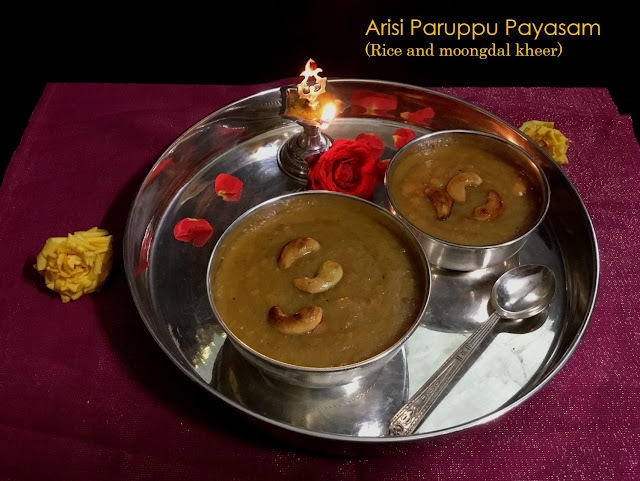 Arisi paruppu payasam prepared with moong dal, raw rice, jaggery, coconut and cashew nuts. This payasam is easy to make with simple and healthy ingredients. Heat the pan or kadai for about 2 to 3 minutes because a hot pan is essential for roasting the dals and rice for a nice aroma in the payasam. Dry roast the moong dal till it turns golden brown in colour. 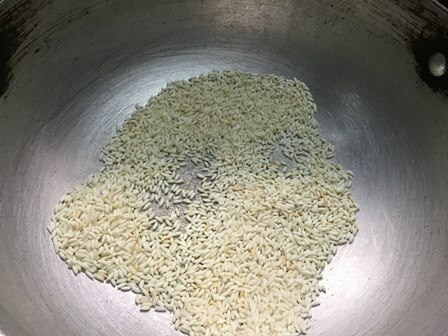 Then add the rice and roast them well for a few minutes. When it starts to brown, turn off the heat and transfer it to a plate. Take a small chutney jar and powder the roasted rice. No need to powder them finely. Now add the roasted dals and powdered rice in a pressure cooker and pour 2 to 3 cups of water. Mix them well with the ladle and close it with the lid. Pressure cook for 4 to 5 whistles. Allow the pressure to settle down naturally. 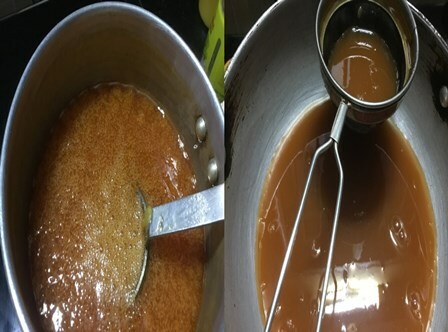 In the meantime, dissolve 2 cups jaggery in a vessel with 1 cup of water. 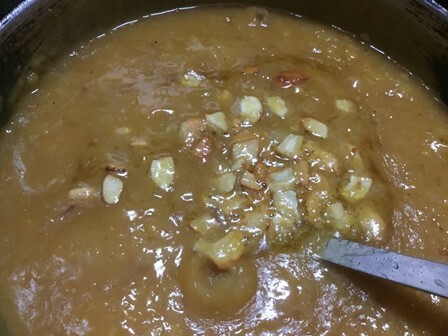 When it completely dissolves, strain the jaggery and add it to a heavy bottomed kadai.. Grind the coconut and cardamoms to a smooth paste. Open the cooker and gently mash the dals with the ladle and keep it ready. Keep the kadai on low heat and stir it well. 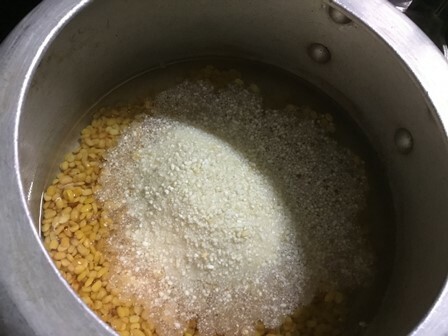 Add the cooked dal and rice to this jaggery syrup. Mix them well without any lumps. When the payasam starts to boil, add the coconut paste and some more ghee. Cook on low heat for about 20 to 30 minutes. 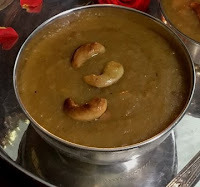 Heat a tsp of ghee in a small frying pan and roast the cashew nuts till golden brown and add it to the payasam. When the payasam gets thick and the raw smell of the coconut paste disappears turn off the heat. After 10 to 15 minutes, transfer the payasam to the serving bowl. 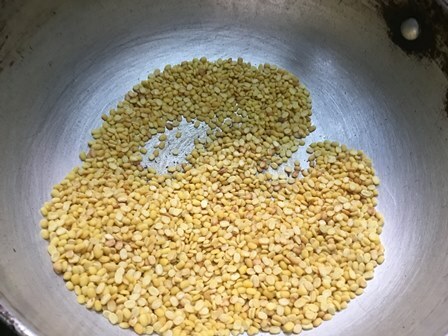 Dry roast the moong dal till it turns golden brown in colour. Transfer it to a plate. Then add the rice and roast them well for a few minutes. When it starts to brown, turn off the heat and transfer it to a plate. Take a small chutney jar and powder the roasted rice. No need to powder them finely. Now add the roasted dals and powdered rice in a pressure cooker and pour 2 to 3 cups of water. Mix them well with the ladle and close it with the lid. 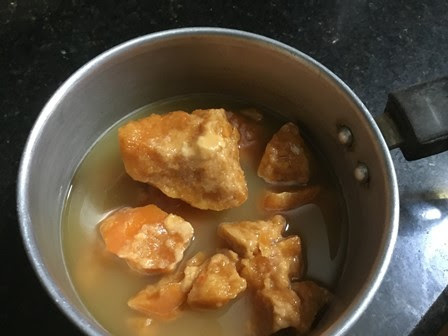 In the meantime, dissolve 2 cups jaggery in a vessel with 1 cup of water. When it completely dissolves, strain the jaggery and add it to a heavy bottomed kadai. Grind the coconut and cardamoms to a smooth paste. Open the cooker and gently mash the dals with the ladle and keep it ready. Keep the kadai on low heat and stir it well. 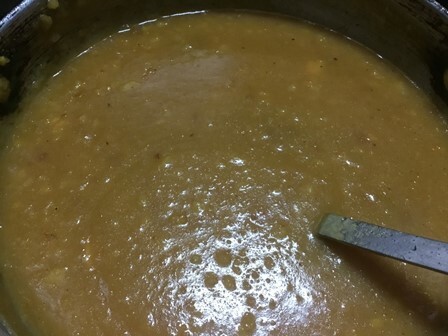 Add the cooked dal and rice to this jaggery syrup. Mix them well without any lumps. Add 2 tbsp ghee. When the payasam starts to boil add the coconut paste and some more ghee. Cook on low heat for about 20 to 30 minutes. Stir them in between. Serve this payasam warm with appalam or banana. 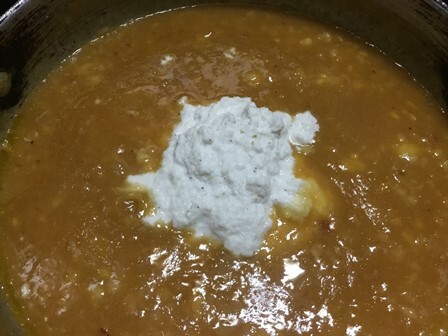 If the payasam appears thick you can add warm milk and then serve. Instead of coconut paste you can also add coconut milk in the final stage. After adding coconut milk allow for a gentle boil and turn off the heat.